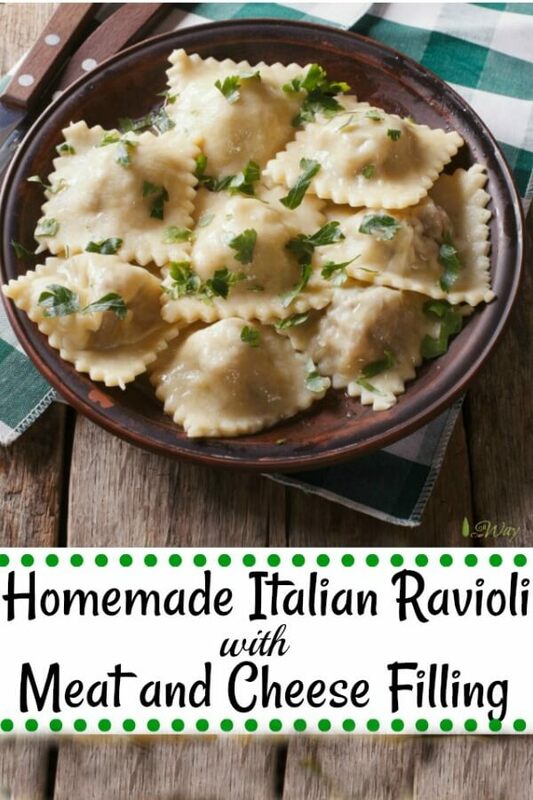 Making homemade Italian ravioli with meat and cheese filling may seem like a troublesome task because of the multiple steps, but the steps aren’t difficult and the process can be lots of fun. When we make the little meat and cheese filled pillows, we plan on making a double and even a triple batch. This is Italian cuisine at its finest. They freeze beautifully and it’s wonderful having these delicious bites of pasta on hand when we’re too busy to make something special for dinner, or even if the unexpected company is coming. and then covering them with a delicious sauce. All you need for an all around delicious meal is a tossed salad with Italian dressing and some homemade crusty Ciabatta bread. This is all it takes to complete the perfect Italian ravioli meal. With steps combining the two to make the finished pasta pillows. Our first step is to gather the ingredients and prepare to make the filling. The Ravioli Meat & Cheese Filling is Cooked and then Put in Food Processor to Make a Fine Texture. We cook the meat, and once it’s cooled, we put the filling in the food processor. Pulse the processor several times until the texture of the filling is fine. The filling goes back into the bowl and then off to the fridge to firm up. The filling is so much easier to work with when it’s cold. The second step is to make the pasta for the Italian ravioli in our food processor. We use our processor a lot! It makes doing a lot of little jobs much faster. The dough comes together in a matter of minutes. Once we zipped, zipped the dough in the processor we let it rest covered on the counter. By the time the pasta finishes resting on the counter, the filling cooled. The pasta now goes ready through the roller. In the third step we pass the dough through the widest setting 4 times, folding the dough each time into thirds. The dough becomes very pliable and durable as we continue to pass the dough through the thinner settings. We continue until we reach the number 5 setting. We use about one teaspoon of filling for each little pocket. 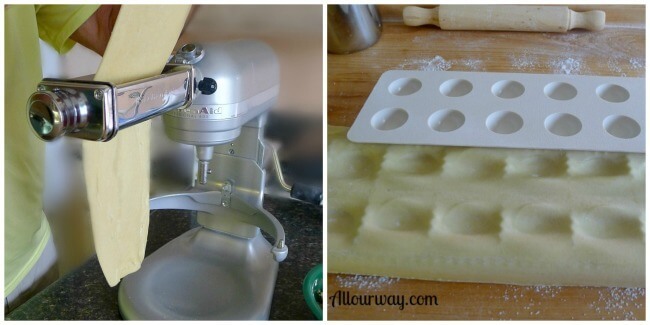 The ravioli form is so easy to use, it makes ravioli production extremely easy. You do have to be careful not to overfill, you want the edges to seal. 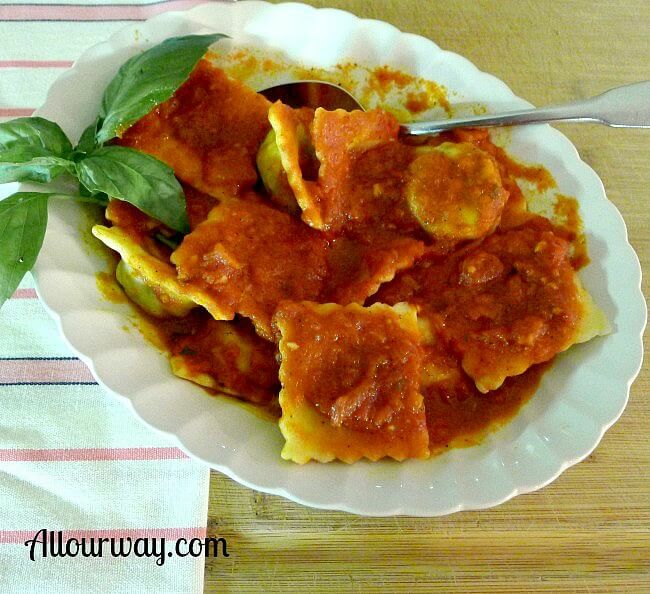 If there is too much filling, the ravioli may pop open when you put them in simmering water. We lightly mist the bottom pasta layer with water before we add the top layer of pasta. This insures that the pasta will seal. When we’re ready to seal the dough we start to press the rolling pin from the center to one end and then start from the center and go to the other end. The dough stretches, this way the dough stretches evenly. We go over the top several times to make sure that the edges are sealed. 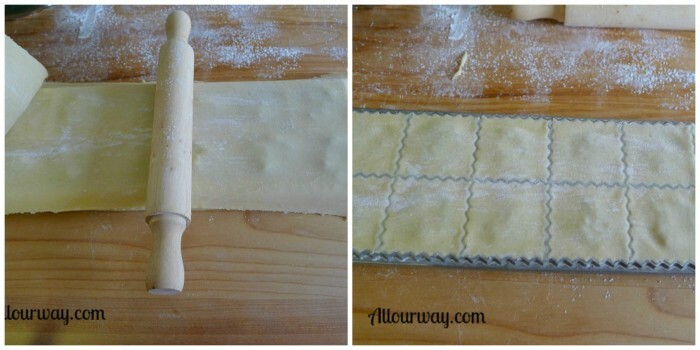 The extra pieces of dough that we cut off the edges we reuse by running them through the pasta roller. The dough is very forgiving and easy to work with. The fourth step is to transfer the plump meat and cheese filled pasta to a parchment lined baking sheet. As soon as we fill one baking sheet, we put it in the freezer and start on another sheet. 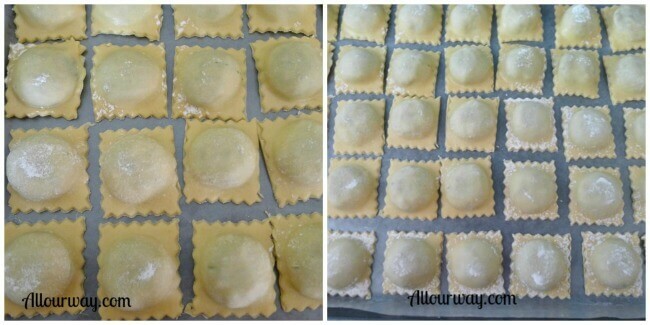 Once the ravioli freeze, we seal them in freezer bags and put the bags in freezer containers. Finally, we’re at the best part — cooking them. We fill a pan with water, let the water come to a boil, salt the water, then gently slide the Italian ravioli into the water. Keep the water at a gentle simmer, the ravioli will be less apt to break open. We let the ravioli cook for about 3 – 4 minutes. If the ravioli are frozen, cook a minute more. We use our spider to fish them out of the water and then we add whatever sauce sounds good. These little pockets of flavor are so tasty and versatile. You can dress them up with any sauce, even an Alfredo if you like. We’ve even deep fried ravioli and had them as an appetizer. Believe me, they are so good I bet you can’t stop at one! We are planning on making a whole collection of ravioli recipes – keep an eye out! YOU MAY NEED . . . The following are affiliate links. We are a participant in the Amazon Services LLC Associates Program, an affiliate advertising program designed to provide a means for us to earn fees by linking to Amazon. com and affiliated sites. Thank you for being a part of All Our Way! Homemade pasta filled with a spicy meat and cheese filling is just what you find at local village restaurants in Italy. 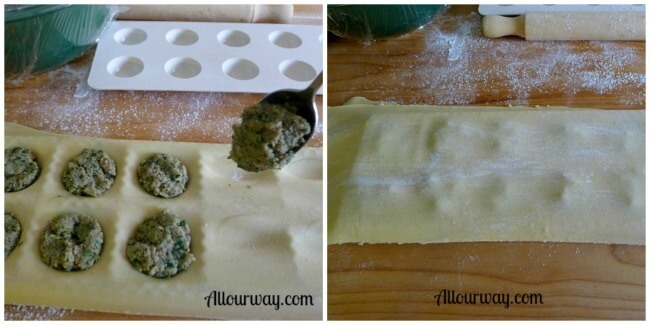 You can bring that experience home by making the pasta pockets yourself. They’re easy to make and delicious to eat. You’ll never buy ready made again. If you like this recipe, please consider giving it a 5-star rating. 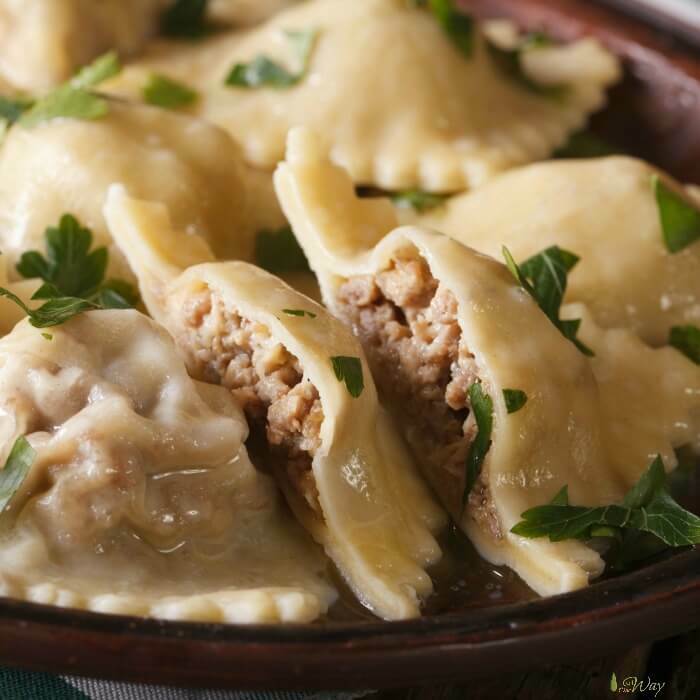 A flavorful meat and cheese filling for the homemade ravioli dough pockets. It's a versatile filling that can be spiced up with hot pepper flakes and garlic or a different type of cheese can be added if you would prefer to make it "all your way." The pasta dough can be used for any type of pasta shape or dish. Every Italian dish is improved 1000% by making your own pasta. 1 cup spinach leaves baby spinach chopped. When the meat cools a little put it into a large bowl and mix in the chopped spinach. chopped parsley, beaten eggs and the rest of the ingredients, add salt and pepper to taste. 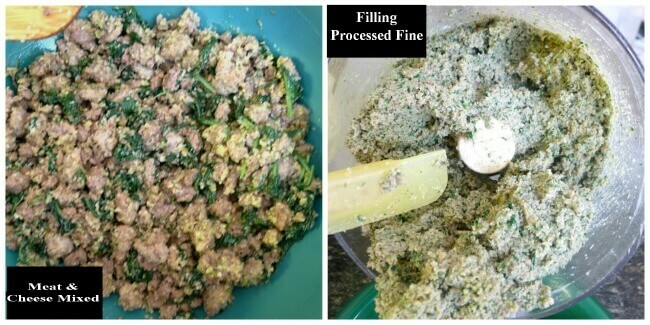 Put the filling into the food processor bowl and pulse several times until the mixture is fine. Return the filling to the mixing bowl and refrigerate. (The filling is easier to work with when refrigerated.) The filling will give you enough for a double batch -- making about 90 - 100+ ravioli. The filling can be frozen. Using the metal blade pulse the flour and salt together. Lightly stir the eggs and olive oil in a measuring cup. With the processor running, add the egg/oil mixture all at once through the feed tube until a ball is formed then pulse several times. The dough should be slightly sticky to the touch and should spring back when you press it. Form the dough into a smooth ball and place on a dough board or tabletop and cover with a bowl for 30 minutes. After 30 minutes you can make the dough into your preferred shape. This is a single batch --you'll need to double the dough to use up all of the filling. Gradually add eggs and oil to flour, mixing with a spoon. As the mixture becomes lumpy, begin to press together and knead with your hands. If mixture seems too dry and grainy, add one tablespoon of water at a time until the mixture holds together into a ball. Remove dough from the mixing bowl and begin to knead dough for 2 minutes on a lightly floured dough board or table top. Cover the dough with a bowl and let the dough rest for 30 minutes. Allowing the dough to rest will improve the texture of the dough. Bring a large pot of water to a boil. Salt the water. You want your water as salty as the sea. Add the ravioli in batches. About 10- 12 at a time. Don't overcrowd. Bring the water back to a gentle simmer and cook for about 3-4 minutes. If the ravioli is frozen, cook for an additional minute. Remove with a slotted spoon or spider to a serving dish. Continue cooking the rest of the ravioli. Serve with your favorite sauce or just with extra-virgin olive oil, butter, sea salt, and freshly ground black pepper. 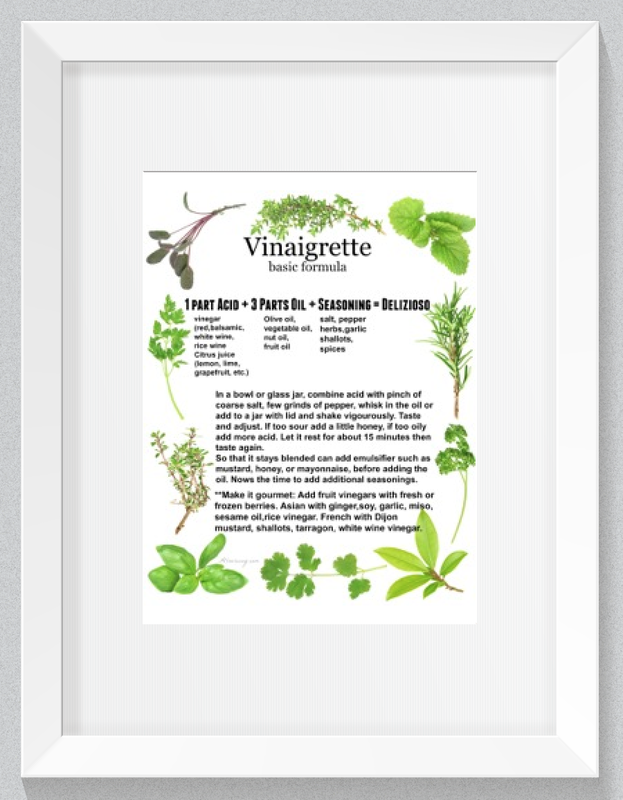 Sprinkle with fresh herbs. 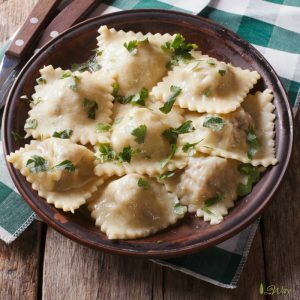 To use up all of the meat and cheese ravioli filling you'll need a double batch of pasta dough. If you don't want to do it all at once, you may freeze the filling to use at a later down. No way will frozen ravioli cook in 5 minutes. They will take at least 20 minutes. Hi, Jerry! That is how long our frozen fresh pasta ravioli take. The larger ravioli may take a minute or two more. Then we add the ravioli to a sauce and it cooks a bit more. I’m afraid that if you cooked fresh pasta ravioli for 20 minutes you’d have ravioli that weren’t edible. I am having trouble getting the ravioli out of the base any suggestions is it alright to pilot? Hi, Dolly! Make sure that you have floured the dough and the form. I know sometimes too much flour can make it difficult to seal the top dough to the bottom. What you can do is lightly spritz some water on the bottom dough before you put on the top. Then use the rolling pin. And sometimes I do have to coax those little pillows out of the form. They eventually come out. Let me kow how it goes. How long do frozen ravioli keep? Also, if i wanted to add spinach to the dough, how would you recommend I do this? Great recipe, thanks! Hi, Rae! If you put them in an air-tight bag and then in a freezer container they will last for one to two months. Ideally a vacuum sealer works great – our son has one and the ravioli would last even longer. What is most important is that you get as much air out of the bag and container as possible. If you want to make a spinach pasta- thaw out a 10- ounce package of frozen spinach. Squeeze as much water out of it as you can, that’s super important. In a food processor combine the spinach, 5 eggs, and puree until the mixture is dark green and smooth. In a bowl whisk 4 cups of all–purpose flour with 1 teaspoon salt. 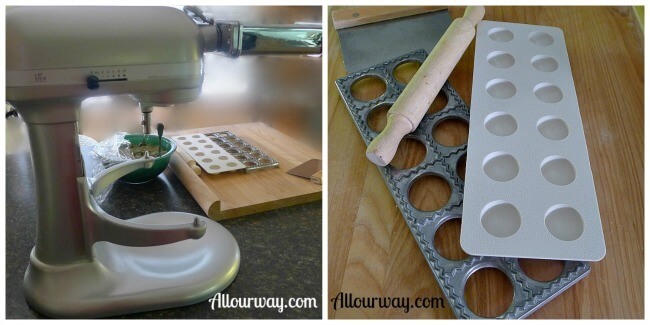 Pour the flour on a bread board, countertop, or silicone pastry mat. Make a well in the middle of the flour. Pour the spinach-egg mixture in the middle and using a fork start working in the flour. When you can, start kneading it adding more flour. When the dough is smooth and slightly tacky but not sticky. Set aside, covered with plastic wrap. About 20 minutes, to let the gluten relax. Then make your pasta in whatever form you want. hahahah you should fix that…. Thank you, Lindsay!! I will definitely change that!! Have you ever though of being a copy editor? My Hubby who reads what I write was supposed to catch that!! Hi, Dixie! I corrected it! I reread what I write so many times it takes fresh eyes to capture mistakes 🤣 Hope you have a wonderful year!! Your ravioli look divine! I would like a huge bowl right now! It seems so easy to make them, but I know that you really need to have the right skills and equipment. I have always been too nervous to try this at home, but I really appreciate the step by step recipe to make it feel less daunting! I am going to give it a try! Marisa you make traditional recipes with great ease. 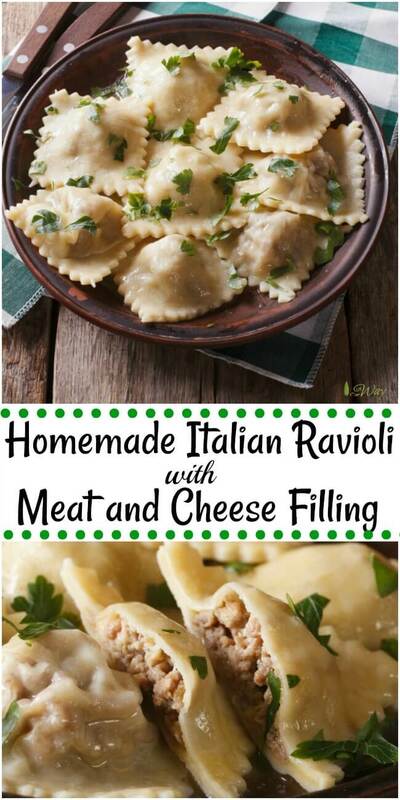 I love this ravioli meat and cheese filling looks delicious. I don’t have a ravioli cutter. I need to get one. Even without heavy sauce this sound delicious.